Simone Touseau, a French collaborator, being marched through the streets of Chartres prior to the liberation of Paris by the Allies. Photograph by Robert Capa of Magnum Photos. I had never heard the phrase “ugly carnival” until a couple weeks ago, when I awoke rather abruptly in the middle of the night, consumed with anxiety about electoral politics in my country, googling search results about an image I couldn’t get out of my head. Whether this retina-burn woke me up or kept me up, its insistence on being resurrected and brought to the fore of my consciousness had both the abrupt stunning characteristic of nightmare and the seemliness of a faint strain of music, playing in a minor key, a menacing leitmotif. In any case, I woke up thinking about this image taken by Magnum photo agency founder Robert Capa. It shows a woman carrying a baby, her head shorn, being marched through the streets in the most literal walk of shame ever, jeered at (and likely worse) by French partisans closing in on every side of her. She holds her baby to her as both a point of focus and as a means for self-grounding, having her gaze and attention focused totally on the child—perhaps literally transferring herself from the present moment and into one where she exists solely as mother—as she is made to keep walking, and walking, and walking until the surrounding crowd grows bored or tired of the spectacle. So it is 1:30am Mountain Time. Search terms such as “Robert Capa + French Collaborator” and “Robert Capa + Liberation of Paris” are flying into the search engine, the bright blue glow of the screen eliminating any remaining chance for sleep that night. And then the rabbit hole I began to go down was the one where I discovered that while this image taken by Capa may be the most iconic, it was by far not the only one. And that what happened to Simone Touseau in Chartes on August 18, 1944 happened to a conservatively estimated 20,000 other women in France alone (and I say this is a conservative number because it is estimated that over 80,000 French children were fathered by the Wehrmacht during the four years of the French occupation). The crime for which this punishment was meted out? “Collaboration horizontale” (a term I kept coming across that made me rage-groan) with the enemy during the occupation. Proof was as variable and a matter of convenience as it often is during periods of mob rule and reason: with Simone Touseau the proof was the three month old baby she was carrying. For others it was because they worked somewhere that the German soldiers frequented, like a laundry, or a brothel, or a restaurant. For still others, it was mere baseless but loud speculative accusation, sometimes for the self-interested reason of deflecting attention away from the accuser’s collaborative crimes of similar nature. There was a strong element of vicarious eroticism among the tondeurs and their crowd, even though the punishment they were about to inflict symbolised the desexualisation of their victim. This “ugly carnival” became the pattern soon after D-day. Once a city, town or village had been liberated by the allies or the resistance, the shearers would get to work. 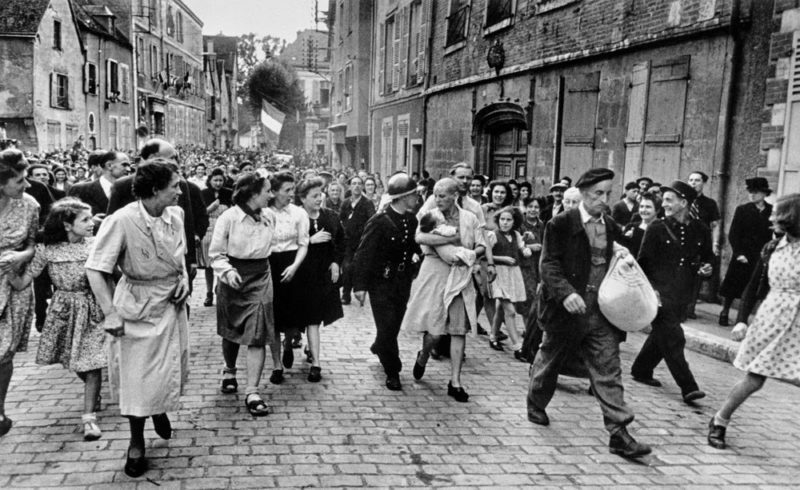 In mid-June, on the market day following the capture of the town of Carentan, a dozen women were shorn publicly. In Cherbourg on 14 July, a truckload of young women, most of them teenagers, were driven through the streets. In Villedieu, one of the victims was a woman who had simply been a cleaner in the local German military headquarters. In so many of these images, the tondeurs were gleefully manhandling their…victims? My sense is that this is the only appropriate word. There are sickening sequences where the woman is taken from her home, then dragged to an open and public location, and then held down and roughly shorn. Another very memorable image is one of a group of women being marched to a police precinct, and on the way they are very self-consciously touching the hair that soon won’t be, any longer. A haunting photograph picturing a woman walking with her back to us, arms gripped by a man, walking her onto a public square nearly emptied, save for other women and their discrete puddles of hair that had been stripped from their heads earlier that day. Embedded alongside all of this imagery, in the essays and blog posts that I found them in, were often patronizing, paternalistic and frankly misogynistic commentary either diminishing what was being done to them (“And don’t think the ladies didn’t appreciate the attention! However, that does not mean that collaborators deserve a free pass, not by a long shot,” opined one WWII enthusiast), or the perceived smallness of the punishment (“A shaved head? Big deal. Hair grows back,” offered a thoughtful commentator). The pictures, and the practice are deeply disturbing, no matter what the context. I am not arguing for or against the reasons, real or imagined, that women had for collaborating with the enemy. I am not arguing for or against lives lost in the holocaust or WWII, or whether such punishment was too little or too much. What I am arguing, and what was keeping me up at night, is that this need and desire to bring a woman—or women, en masse—to heel, to humiliate, publicly degrade and parade that humiliation, and create a marker for shame that can be easily seen and recognized for a considerable amount of time (so that the shaming and punishment can continue), that there is something deeply familiar about this punitive need, something timely… something Trump-y. Today is the day that America is in the process of electing for president either a woman representing the escape from such legacies or a man who would seek to reinstate and reignite the partisans among us. With full knowledge that the American electorate and its constituencies have myriad reasons for voting the way that they will, I am and have been disturbed by the apologist language I’ve heard used to describe Trump’s language (“he has diarrhea of the mouth,”), his calls to action (“He’s just seeking the free media attention,”), and his systematic debasement and diminishment of any group or class of people that he deems other, suspicious, or offensive. Women, as a whole, are on that list. Images like the one of Simone Touseau that Robert Capa took, make me feel deep empathy and sadness. I identify with her. For others, the image represents a return to order, the righting of wrongs, justice being done. When I wake up tomorrow and this election is finally behind us, I hope I wake up to the popular majority choosing empathy, even if it’s by the slimmest of margins. Ein-Fuß-Gänger, Otto Steinert, ca. 1950. The circular decorative grate surrounding the tree, mirrored in infinite repetition by the arc of the cobblestones adjacent to it in the street. 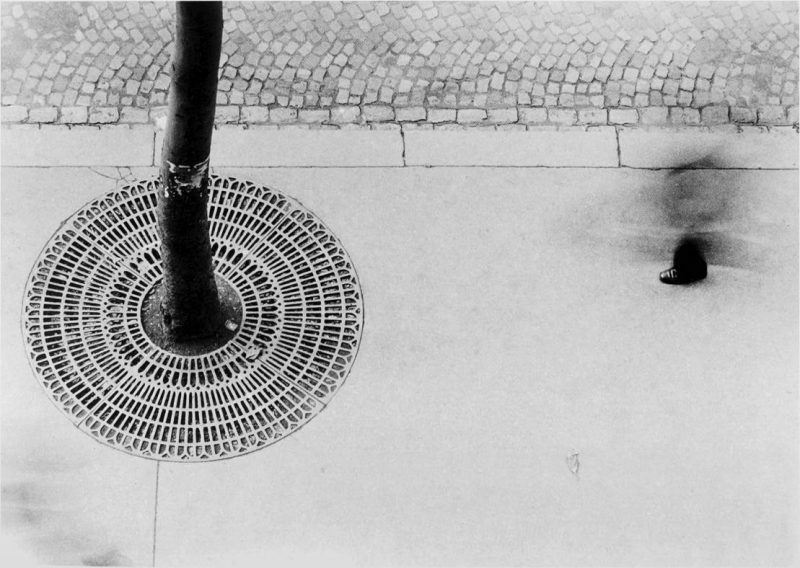 There is both verticality and horizontal elegance in the image, with the picture plane divided into nearly precise thirds: the grate and tree in the first third, a “blank” of cobblestone, street and sidewalk in the middle third, and the last third the same as the middle, but with the startling, surreal addition of an in-focus foot with what we presume is a blurred body attached to it. Is it a blurred man? Or is it an erased man? It’s more of a mark on a page than the blur of motion that we’re seeing, the kind of mark made in a gesture of erasure. Make a drawing of a man in charcoal, then close your fist and smear it across the entire image of everything man-like of him save the foot. Everything else in the image is there, defined, and still: the grate, the tree, the sidewalk, the cobblestone street. Only the man is animate; and in his blur and in his foot, we are told that we cannot be sure of him, either. Or sure of what we think that we see. Otto Steinert was a German medical doctor during WWII, and afterwards abandoned medicine to pursue photography. Greatly interested in what the Surrealists, and afterwards in Germany, what the Bauhaus movement had begun prior to the war (and what had been labeled “degenerate art” and banned by the Nazis during the war), Steinert aimed to pick up aesthetically where the movements had left off. Coining his first curated shows “The Subjective Movement,” members of the Fotoform group experimented with combining formal vision with evoking an inner psychology on film, and to those ends played wildly with photographic and darkroom technique, in much the same way László Moholy-Nagy was doing at the Institute of Design in Chicago, and his protegés Harry Callahan and Aaron Siskind after him. Steinert referred to what he was doing in the movement as “visual research,” and stated that the Subjective movement was concerned with “humanised, individualized photography,” and in reaction to the “objective” notions of photography as well as the propaganda-disguised-as-journalism use of the genre that preceded Fotoform. What’s of particular interest to me is that like the young photographers coming out of the post-war Japanese photographic movements, there was a strong and instinctive shift away from using photography to describe anything that claimed to be “real” “objective” or “true.” Both Japan and Germany were mired in reconstruction not just of their cities but of a collective national identity in the face of being on the losing side of an epic world war. One of Japan’s most interesting answers, coming a little later in the 1960s, was the VIVO and Provoke movements, which sought to “provoke” collective thought, action and art by fusing and cross-pollinating ideas with artistic and political mediums and practitioners. Dance, politics, photography, literature and theater were all ingredients to foment revolution, art and change for the young in Japan. In contrast, Steinert’s avant garde called for a turning inwards through photography specifically, and using the medium to evoke personal and individual responses to the realities of the outside world. To comment on the inner state and claim only that authority, rather than to pretend to accurately reflect the outer state. What I’ve always loved about Ein-Fuß-Gänger is its inside-out-qualities; how it is and is not what it purports to be, that in the end it doesn’t purport to be of or about anything at all. It’s a bit of a visual joke, it’s quiet, it’s a small image and you could almost miss it entirely if you weren’t looking long or closely. It’s ambiguous, formally very pleasing, and it is an image that I could linger over for a long, long while, losing myself in thoughts of absence and presence, the real and the notion of fiction, of place and not-place. Shortly after the war, in 1949, Steinert moved to Paris, which is where he made this image (ca. 1950). While I do not know much of his biography, and do not have any texts confirming this or telling me otherwise, I speculate that it was very appealing, perhaps even necessary, to remove oneself from the reality of a bombed-out German city during reconstruction, to attempt to resurrect one’s identity and self by escaping to a beautiful foreign city that was comparatively intact, civilized and yet somehow Other enough to not see oneself clearly reflected back in it. That indeed, the blur or the erasure of man was not just attractive or an exercise in subjective photographic abstraction, but a desire to disassemble, disintegrate, disappear. Yukio Mishima, as photographed by Eikoh Hosoe for the publication Barakei, or, Ordeal By Roses. This is it. The image that forever did me in, the one that turned me into a Japanese photography addict. To tell you what you are looking at is one thing, and flatly stated it’s rather simple: this is a photograph of the late author Yukio Mishima, standing on a marble zodiac in front of his home, wrapped in a garden hose—the end of which is stuffed into his mouth, held there (in a gesture of pulling it from within himself) with his left hand. In his right hand, he holds a wooden hammer, raising it above his head. He is looking up. The photograph was shot from above, taken while standing on a ladder. Mishima’s gaze is direct, intent and provocative. To explain what this photograph is, however, and what it means, is something else entirely. And the answer will vary depending on who you ask. In the preface to the book, Mishima wrote that what he came to understand in the course of the making of Barakei was that all photographs were either “..a record or a testimony.” What he’s referring to is very similar to John Szarkowski’s assertion that a photograph either becomes a mirror or a window, and this modernist dichotomy is fittingly evoked by Mishima, given that he was a figure that was deeply divided between his fascination and love for classic western culture as well as fanatically devoted to describing and elevating the culture of a pre-WWII era Japan. Mishima’s father happened to be watering the garden, so I grabbed the hose, and wrapped Mishima in it. I completely wrapped his body in the hose and kept him standing in the center of the zodiac where he was planning to erect a statue of Apollo. I asked him to look up and concentrate on the camera which I was holding on a ladder above. I asked him to lie on the zodiac and I photographed him from a low angle on the ground. Then I asked him to walk slowly, with the hose still wrapped around him, and to lie down in the narrow space between the wall of his home and his neighbor’s house. I continued shooting for about an hour. “This is the destruction of a myth,” I replied. To me, it is an image that seems to recount a myth, one that is particularly Promethean in character. In the above photo, Mishima looks as if he has had that hose in his mouth for all time, and as if he will be holding that hammer up in the air for about as long. Prometheus is best known for giving humans knowledge of the gift of fire, which had previously been the sole dominion of the gods. In punishment for his overreaching, Prometheus was bound to a rock and made to have his liver picked out by an eagle every day, only for the wound to heal and the liver to regenerate overnight, so that he could be punished anew each day. Mishima’s life itself was caught between battling impulses and competing aesthetics, which for the author became a literal matter of life and death. Obsessed with Greek mythology and the martyrdom stories and iconography of Christian saints, Mishima was also radically political, adhering to a bushido creed and, at the end of his life, attempting a coup d’etat to restore the power of the emperor. He was among the best known contemporary writers of modern Japan, was enormously prolific in his (too) short life, writing over 30 novels, and was nominated for the Nobel Prize in literature three times. What was remarkable about this photograph (and the entirety of the Barakei series, but especially this image) is that it exemplifies what it is to have an encounter with someone whose will and creative fortitude is equal to that of your own. An encounter is not adversarial, but collaborative. Each player is open and loose, but still entirely contained within themselves and within their own power. Both experts at trained spontaneity. They improvise with one another, allowing themselves to be used as material by the other, and in turn still exercise their own creative will throughout. Hosoe was a young photographer coming to the home of a well known and revered author. What he did that day on Mishima’s lawn was an example of zen audacity: Eikoh Hosoe walks into the world of Yukio Mishima with the end goal of making photographs of the man. Leaving himself open to Mishima’s environment and what it might reveal about him, he entered the scene with no preconceptions. 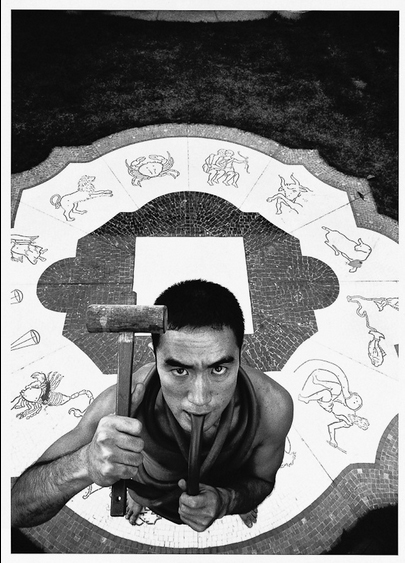 He sees the garden hose and audaciously wants to wrap him up in it, stand on a ladder to photograph him from above, with Mishima placed in the center of his own zodiac. The act of wrapping Mishima in a hose is one that says, effectively, “I can’t work with you if I have to worship you.” And in the act of binding the author, Hosoe liberated himself from him. Mishima, in turn, accepted the initiative and humbled himself, finding it both profound and amusing. In the West, a portrait is often the negotiation between the photographer and the subject, a mediation between the desire on the part of the sitter for a good image, and that of the photographer to make an image he deems worthy of himself (or, as I’ve suggested previously, all portraits are a form of self-portraiture on the part of the photographer). That is not what happens in this photograph. Mishima surrenders entirely here. There is no negotiation. He surrenders with trust, knowing that whatever happens photographically, Mishima will still be Mishima. He is opening himself to the experience of self-transformation under Hosoe’s direction, essentially trusting Hosoe in an act akin to a kind of photographic psychoanalysis. Hosoe, in turn, knows how to trust his own responses in the midst of an intense encounter with an intense personality. This would become the hallmark of all of his subsequent work. Hosoe knows how to get intensity out of a worthy subject; he knows how to have an Encounter. This image is not a record of something about the author Yukio Mishima. Neither is this photograph a testimony of Hosoe’s fantasy idea of Mishima. This photograph is a meeting of the two.